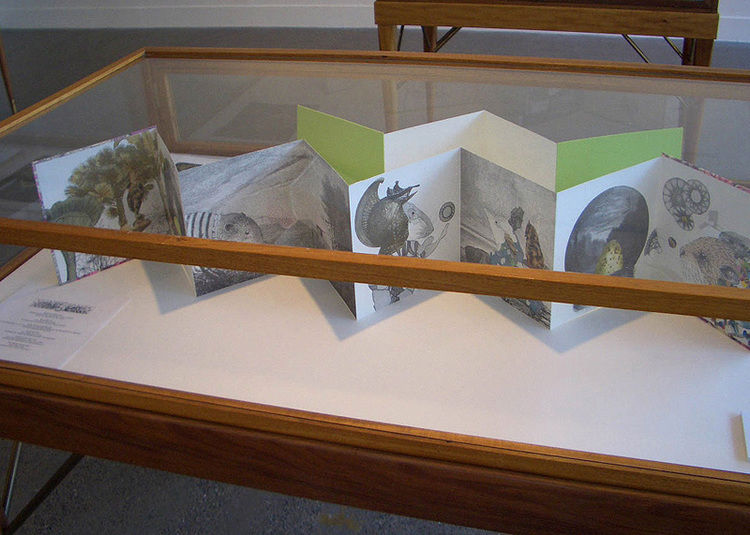 Featuring a cast of extinct animals, a series of artists’ books with a distinct nod towards Agatha Christie, created for and exhibited as part of Ex Libris at RMIT, and later shown as part of Dervish (2006), Fictions (2008) at MUMA, and Interconnections: Books, Text, Art (2014) at the University of Melbourne’s Baillieu Library. Editions of these books are in the collections of the State Library of New South Wales, the State Library of Victoria, Melbourne University Library, Monash University Library, and the National Gallery of Australia (formerly as part of the Ergas Collection). The collaborative team of Gracia Haby & Louise Jennison, who have made the artist's book their signature medium, also reserve their leading roles for extinct species. Their heroes’ adventures have a decidedly Tom Sawyer and Huckleberry Finn flavour, even if the rumours of their deaths have not been exaggerated. Pink-headed Ducks, Giant Rice-rats and Bavarian Pine-voles sport prison stripes and plan jail breaks in order to go fishing amongst desert cacti, while Robust White-eyes play cards and Passenger Pigeons, drunk on alcohol soaked grain, attempt to hatch European Sea Urchins. The Agatha Christie inspired titles — The Case of the Lost Aviary, Trouble at Sea, The Dubious Clue, By the Pricking of My Claws — acknowledge Haby & Jennison’s penchant for amateur detective work. Unearthing incriminating evidence against commercial hunters, volcanoes and ship-jumping black rats, the artists conjure new, pseudo-scientific scenarios, their slippery approach to facts unfolding in whimsical narratives that operate according to their own logic. The artists take liberties with the argument that ‘narrative metaphors are an indispensable part of all ‘factual’ discourse, whether in history or in science’, and wink at the commonly acknowledged notion that the historian’s work is partly scientific, partly artistic. Their Pig-Footed Bandicoots, Deer Mice and Bulldog Rats are as fanciful as their names suggest, precariously balancing sailing boats for headgear or fossils as body parts. Haby & Jennison’s truth is, by necessity, a fabrication, the species themselves being lost for all time, at best leaving only fragmentary data from which to glean information. Their Pig-Footed Bandicoots, Deer Mice and Bulldog Rats are as fanciful as their names suggest, precariously balancing sailing boats for headgear or fossils as body parts. As barely intact as the last remaining specimen of the St Lucy Giant Rice-rat, they threaten to fall apart at the merest touch. Extinct Cloud Runners and White-footed Rabbit-rats croon their woes along with Memphis Slim, drawing on another vehicle rich in narrative history, the blues lyric. The printing process, as both a technical and artistic activity, has been linked not only to the memory of human thought, but also to the memorial process. Prints, in their various guises and mediums, have played a pivotal role in recording the stories of our past, and continue to document possibilities of what might yet become. The best narrative printmakers employ printmaking’s intrinsic properties and illustrative traditions to create new fictions and expose new truths about ourselves, celebrating the invention inherent in all knowledge, in all history. Much of the following discussion of Haby & Jennison’s work is essentially a reworking of my earlier catalogue essay for Ex Libris at RMIT Project Space, 2005. This was used by trappers to make the birds easier to catch. See below. Information on the passenger pigeon and the rats was supplied to the author by the artists, October 2005, citing Clive Ponting, A Green History of the World, Penguin Books, 1992 and Tim Flannery & Peter Schouten, A Gap in Nature — Discovering the World's Extinct Animals, Text Publishing Australia, 2001. Donald N. McCloskey, cited in G.Thomas Tanselle, Printing History and Other History, Studies in Bibliography, Volume 48, 1995.